Get ready to see faces old and new at the Levittown Chamber of Commerce. The chamber held its annual installation of officers and directors dinner on Jan. 16 at Westbury Manor. Not only were the new board members installed, but the Levittown Chamber of Commerce made sure to honor several community members for their service to the chamber and the community. Donald Patane was recognized with the President’s Award for the assistance he offered to outgoing President Joan Lynch, who succeeded him as president in 2016. Lynch thanked him for the advice and consistent reliability he provided. The Chamber of Commerce officially inducted Jon Avner as its new president during the dinner, who is not only an actor, but also a lawyer. “It is an honor,” said Avner, who also goes by Jon Probstein. “I’ve been a member of the chamber for 10 years. I’ve been on the board for a couple of years. I always felt that it’s an honor to serve the community. The Levittown Public Library, Levittown Historical Society and DJ/attorney Timothy Aldridge were each honored for their outstanding community service. Levittown Library Director Trina Reed accepted the award on the library’s behalf. Bob Koenig, vice president of the Levittown Historical Society, accepted it for that institution. Aldridge is well-known for his interest and generosity in providing DJ services throughout the communities of Levittown and Island Trees. The chamber recognized Thomas Di Iorio as Citizen of the Year. Di Iorio is president of the Levittown Lions Club and is also active in American Legion Post 1711 and VFW Post 9592. His military service, contributions to the multiple veterans organizations in the area and the chamber were cited as grounds for his recognition. 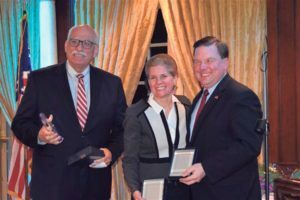 Nassau County Legislator Thomas McKevitt, Town of Hempstead Councilman Dennis Dunne Sr. and Chamber of Commerce office manager Tara Cassano were each presented with special appreciation awards. McKevitt and Dunne earned the awards for their commitment and service to Nassau County and the town. Meanwhile, Cassano received the honor for her exceptional quality of service to the chamber. Cassano, who’s been with the Chamber of Commerce for 25 years, was also recognized with the Distinguished Service Award. Now a director and chair of several committees, she previously served as president of the chamber in 2004 and 2005. On a solemn note, the evening’s honors began with presentations to the families of Lois Cornibert and Eric Rosenblum, who each passed away last year. Accepting Cornibert’s award was her husband Gary, their son Gary and his wife Danielle. Rosenblum’s companion Gail Montello accepted the honor on his behalf. Michael Levy, owner of Minuteman Press in Levittown, was sworn in as first vice president; Christine Sweeney, manager of Sterling Bank, as second vice president; Robert Ryan, Esq. as counsel secretary; and Frank Mormando as treasurer. The named officers include Joan Lynch as immediate past president. Installed as directors were: Donna Callegari, manager of Bethpage Federal Credit Union; Louise Cassano, principal of LuCas Communications; Matthew DiGregorio, commander of VFW Post 9592; Tom Di Iorio, principal of Island Smart Home Inspections; Kathi Donnelly of Liberty Mutual Insurance Co.; Brian Fielding, principal of Mobile Flicks 2U; William Mullan of LevitStyle; Donald Patane of Main Street Financial Group; William Powell of William J. Powell Associates; and Ann Torcivia of Friends Travel and The Joey Foundation. Joseph Wolkin is the editor of the Levittown Tribune.